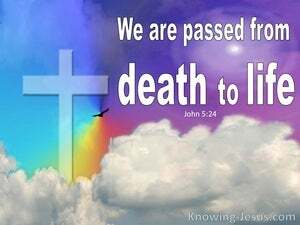 ﻿ John 5:24 Verily, verily, I say to you, He that heareth my word, and believeth on him that sent me, hath everlasting life, and shall not come into condemnation; but hath passed from death to life. "I assure you: Anyone who hears My word and believes Him who sent Me has eternal life and will not come under judgment but has passed from death to life. "Truly, I tell all of you emphatically, whoever hears what I say and believes in the one who sent me has eternal life and will not be judged, but has passed from death to life. Truly, truly, I say to you, that he who hears my word, and believes him who sent me, has eternal life. And he does not come into condemnation, but has passed from death into life. Verily, verily, I say unto you, He that heareth my word, and believeth him that sent me, hath eternal life, and cometh not into judgment, but hath passed out of death into life. "Truly, truly, I tell you, the person who listens to my message and believes [in] the One who sent me [i.e., God] has never ending life [i.e., as a hope. See Titus 1:2; 3:7]. He will not be judged [and condemned], but has [already] passed from being [spiritually] dead to being [spiritually] alive. Verily, verily I say to you, He that hears my word, and believes on him that sent me, has eternal life, and comes not into condemnation, but has passed from death into life. Truly I say to you, The man whose ears are open to my word and who has faith in him who sent me, has eternal life; he will not be judged, but has come from death into life. Truly, truly, I say to you, he who hears my word and believes him who sent me, has eternal life; and shall not come into judgment, but has passed from death to life. I declare unto you, he that heareth my doctrine, and believeth on him that sent me, hath everlasting life, and shall not come under condemnation; but is passed from death unto life. Verily, verily, I say unto you, that he that hears my word, and believes him that has sent me, has life eternal, and does not come into judgment, but is passed out of death into life. Truly, truly, I say unto you, that every one hearing my word, and believing on Him that sent me hath eternal life, and doth not come into judgment, but has passed out of death into life. I tell you, whoever listens to my message and believes him who has sent me, possesses eternal life, and will not come to judgment, but has already passed out of death into life. Verily, verily I say unto you, he that heareth my word, and believeth on him that sent me, hath everlasting life, and cometh not into condemnation, but is passed from death to life. Verily, verily, I say unto you, He that hears my word and believes him that sent me has eternal life and shall not come into judgment but has passed from death unto life. Truly, truly, I say to you, That he hearing my word, and believing him having sent me, has eternal life, and comes not into judgment; but has passed from death to life. 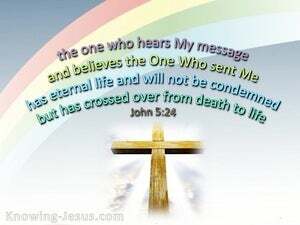 Verily, verily, I say unto you, He that hears my word, and believes on him that sent me, has everlasting life, and shall not come into condemnation; but is passed from death unto life. Truly, truly I say to you that the one who hears my word and who believes the one who sent me has eternal life, and does not come into judgment, but has passed from death into life. Truly, truly, I say to you, He who hears My Word and believes on Him who sent Me has everlasting life and shall not come into condemnation, but has passed from death to life. Verily, verily I say unto you, He that heareth my words, and believeth on him that sent me, hath everlasting life: and shall not come into damnation, but is escaped from death unto life. Truly, truly I tell you, he who listens to my word and believes him who sent me has eternal life; he will incur no sentence of judgment, he has already passed from death across to life. 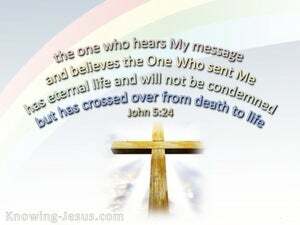 "I tell you solemnly that he who listens to my messages and believes Him who sent me, has eternal life. He will not come under condemnation, but has passed out of death into life. 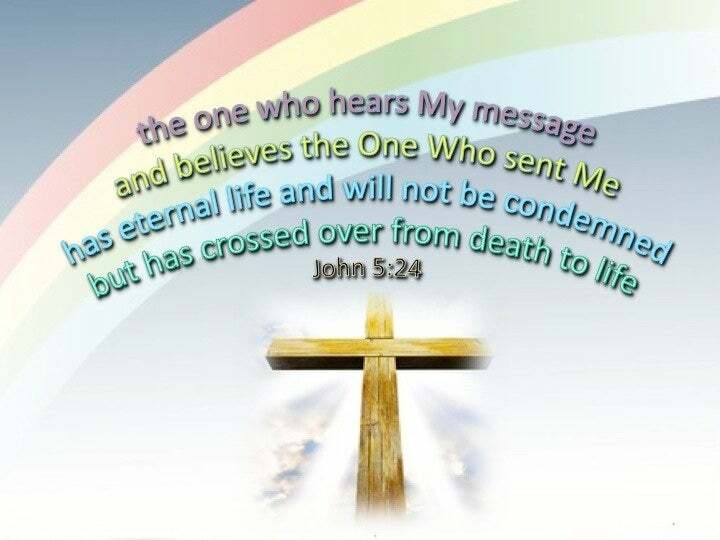 "I tell you the solemn truth, the one who hears my message and believes the one who sent me has eternal life and will not be condemned, but has crossed over from death to life. "Truly, truly, I tell you, he who hears my word, and believes him who sent me, has eternal life, and does not come into judgment, but has passed out of death into life. Truly, truly do I say to you, He that heareth my word, and believeth him that sent me, hath everlasting life, and cometh not into condemnation, but hath passed out of death into life. I tell you most truly, he that hears my word and believes him that sent me has eternal life, and comes not into judgment, but has passed from death to life. Verily, verily, I say unto you: He that heareth, my word, and believeth in him that sent me, hath life age-abiding, and, into judgment, cometh not, but hath passed over, out of death into life. Verily, verily, I say unto you, That he that heareth my word, and believeth on him that sent me, hath everlasting life, and shall not come into judgment; but is passed from death into life. In truth I tell you that he who listens to my Message and believes him who sent me, has Immortal Life, and does not come under condemnation, but has already passed out of Death into Life. "I most solemnly say to you, whoever listens to me and believes Him who has sent me possesses eternal life, and will never come under condemnation, but has already passed out of death into life. "Verily, verily, I say to you, He that hears My word, and believes Him Who sent Me, has eternal life, and comes not into judgment, but has passed out of death into life. Verily, verily I say unto you, he, that heareth my word, and believeth in Him that sent me, hath everlasting life, and shall not come under condemnation; but is passed from death to life. Verily, verily, I say to you -- He who is hearing my word, and is believing Him who sent me, hath life age-during, and to judgment he doth not come, but hath passed out of the death to the life. 23 That all men should honor the Son, even as they honor the Father. He that honoreth not the Son, honoreth not the Father who hath sent him. 24 Verily, verily, I say to you, He that heareth my word, and believeth on him that sent me, hath everlasting life, and shall not come into condemnation; but hath passed from death to life. 25 Verily, verily, I say to you, The hour is coming, and now is, when the dead shall hear the voice of the Son of God: and they that hear shall live. We know that we have passed from death to life, because we love the brethren. He that loveth not his brother, abideth in death. He that believeth on the Son, hath everlasting life: and he that believeth not the Son, shall not see life; but the wrath of God abideth on him. Verily, verily, I say to you, If a man shall keep my saying, he shall never see death. Verily, verily, I say to you, He that believeth on me hath everlasting life. And whoever liveth, and believeth in me, shall never die. Believest thou this? He that believeth and is baptized, shall be saved; but he that believeth not shall be damned. There is therefore now no condemnation to them who are in Christ Jesus, who walk not according to the flesh, but according to the Spirit. And we know that all things work together for good, to them that love God, to them who are the called according to his purpose. Who by him do believe in God, that raised him from the dead, and gave him glory; that your faith and hope might be in God. Whoever believeth that Jesus is the Christ, is born of God: and every one that loveth him that begat, loveth him also that is begotten by him.